Fairways at Battlegrounds Manalapan homes for sale. Call 732-598-7700 to see the Fairways at Battlegrounds Manalapan . In 2005, Hallmark Homes began construction of Fairways at Battlegrounds Manalapan and built of 109 homes. Two models are available in Fairways at Battlegrounds Manalapan. One model, the Kauai is a home with three bedrooms, 2.5 baths, a one car garage and also a basement. This home offers 2199 square feet of living space. Similarly, the other model, the Medinah, has three bedrooms with either a loft or a fourth bedroom It has 2.5 baths, a two car garage and a basement. There are over 2200 square feet of living space in the Medinah, and you’ll find that both models have the laundry on the bedroom level. Lawn care, common area maintenance, snow removal in addition to exterior maintenance is the association’s responsibility, and a monthly fee is assessed. The clubhouse has a swimming pool, tennis plus an exercise room available for residents. Your pets are welcome in Fairways at Battlegrounds. Commuters appreciate living in The Fairways because of the easy access to Route 9. A Park and Ride in Manalapan is available for commuters who wish to use bus service to New York. Route 33 gives access both east and west, also the New Jersey Turnpike is just a few minutes away. In fact, some people drive to Matawan to take the trains to New York. Children in kindergarten through eighth grade will attend the Manalapan Englishtown Regional School System. Children from neighboring Englishtown also attend these schools. 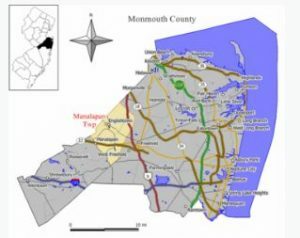 When students enter high school they will attend Manalapan High School, which is part of the Freehold Regional High School District. Also, students are eligible to attend one of the specialized programs available at the other high schools in the Freehold Regional High School District. And when students enter high school they may also apply to one of the five high schools in the Monmouth County Vocational School District. Specialized courses are available in fields such as high technology, computer science, marine studies and biotechnology. Also courses in the medical and science fields are available, among others. Call 732-598-7700 to see the Fairways at Battlegrounds Manalapan.